In addition to this significant segment of the population there are many others who need help cleaning out their property. These are the ones who find themselves liquidating assets as part of a divorce settlement, or simply moving to take on a new job. Regardless of the reasons the task of cleaning out furniture, appliances, household goods and other items can be especially challenging. In the U.S. the average home is about 2,500 square feet. And most of that space is typically full of belongings of one type or another. This is especially significant when the reason for removing and cleaning out a property is the death of a loved one. More often than not, an elderly parent or grandparent will have accumulated years of belongings and quite possibly filling both the house and the garage. This doesn’t even take into account rented storage units, or storage sheds on their own property. Separating and cleaning out all of this can be overwhelming. When an estate sale is needed, the individual usually approached is an estate liquidator. It’s estimated that in the U.S. there are approximately 14,000 estate liquidators. According to the American Society of Estate Liquidators, members must meet certain education or experience requirements, and abide by a code of ethics. But it is estimated that most liquidators have no formal training. Essentially anyone can set themselves up as an estate seller. 1. Find and set aside all key financial documents. Locate and secure any will, trusts and related documents; Look for life insurance policies and statements, real estate deeds and titles; obtain recent bank statements if none are in the home; retain any stock certificates; 401(k) records; tax returns and receipts. These may be necessary for filing any income tax returns. 2. Pay attention to detail. People tend to stash things in unlikely places, or forget that something valuable has been left in a coat pocket or the back of a desk drawer. Take the time to look through everything. This would include pockets in clothing, drawers, high shelves, every container, etc. 3. Work with family members on sharing items. One strategy that can help is to have family members create a list of the items they’d like to have from the estate. While this can work well, unfortunately there are situations where conflicts and disagreements can arise. If necessary, involving outside mediators or legal help may be helpful here. 4. Try to find and keep photos and other memorabilia. Often these types of items are of little value to people outside of the family. However, they are irreplaceable for family members. The idea is to think of the future of grandchildren and others who may well find these pictures, scrapbooks, albums, etc. as a physical and tangible link to family members they may never have had to privilege to meet. 5. Donate or sell clothing. Most clothing has little resale value, unless it's vintage clothing which is typically considered as items from the early 1960s and earlier. Consignment shops can sometimes be a source for gaining some revenue from old clothing as well as eBay or yard sales. Donations are, of course, always welcome and this can be handled for you by others. 6. Hire an estate appraiser. If the estate is comprised of a substantial amount of furniture, jewelry and antiques it is typically worthwhile to make use of their services. An accredited professional will give you an estimate for each item and typically charges an hourly fee to do so. The cost will depend on such factors as your location and the type of appraisal you want. 7. Get help. The work can be overwhelming, both physically and emotionally. Some of the tasks are simply monotonous and lengthy, such as sorting through paperwork. Other tasks require physical exertion such as cleaning, moving furniture and possibly hauling items and debris. This is where the services of a professional estate cleanout service such as Junk King can be invaluable. You want a company that will be punctual, patient, and respectful while treating you with care. Whenever possible, we will donate as many items as we help families transport items that belong to departed family members. With years of experience in helping our customers with estate cleanouts, we understand that when a loved one passes away you don’t need to worry about cleaning up their apartment or house. Whether you are handling an estate sale, are downsizing, or dealing with the daunting and formidable task of clearing a deceased relatives home, place of business or any other property left behind, we can help you through. Our estate cleanout services are used by landlords, attorneys, banks and homeowners who need to dispose of unneeded and unwanted items, junk and clutter that might prevent or slow down the process of handing over an estate. Our team specializes in large debris removal and furniture hauling. We can be on location in mere minutes, so call us today! Our crew is fully insured and well-trained, so you can trust them to get rid of your unwanted items in a professional and courteous fashion. 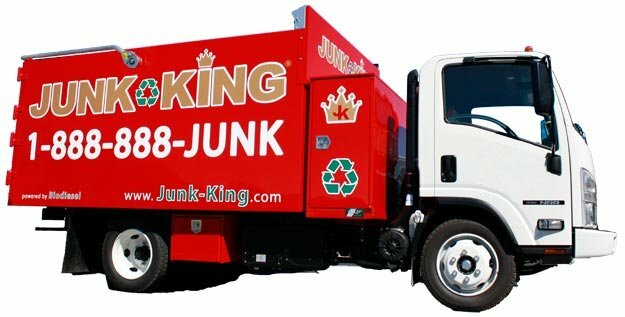 One of the best things about hiring Junk King is that we recycle a much of the material we pick-up. This is proof of our commitment to being an eco-friendly removal service. If you have questions about what we do or what we believe, give us a call at (707) 744-4254.